Anyway, IÂ found some lovely designer classy smart casual wear onÂ the website of Onward Kashiyama and thought I’ll feature them here.Â I love these outfitsÂ for their simple cuttings and intricate details.Â Check out those pretty hemlines!Â So contemporary and feminine! 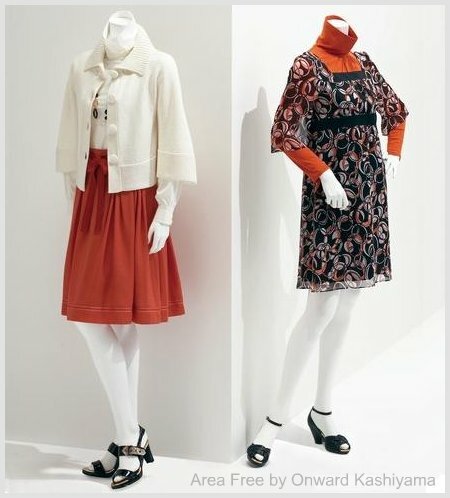 I can see these outfits on a Japanese woman who is in her 20s,Â 30s and even early 40s!Â And of course it helps that most Japanese ladies never grow fat and have lovely complexion. I think there’s something to be learnt from the Japanese on how toÂ put together that impeccable coordinated style and look real smart even when it comes to casual wear. HI, every year I went back Japan, their fashion is so updated & pretty. They really dress up themself when they are out, even to the nearest supermarket, which my mother in law also make up when she do some grocery shopping.I just back from Japan , been there for 2 weeks, brought a lot of magazine come back. I feel that no matter u are single or married, still have to doll ourselves up and don’t be like aunti even though the person is married!Their fashion,cosmestic,skin care products & etc…. never outdated. Florence: Ya, they’re always so impeccable and always looking good! I love Jap fashion magazines. I only buy those that are launch around spring/summer time coz those autumn/winter styles are not suitable for Spore weather. Japan’s fashion is timely since it showcases the forecasted colors for year 2010. Blue and silver are the major colors for 2010. I like to wear Japan’s fashion since it gives me a contemporary look.